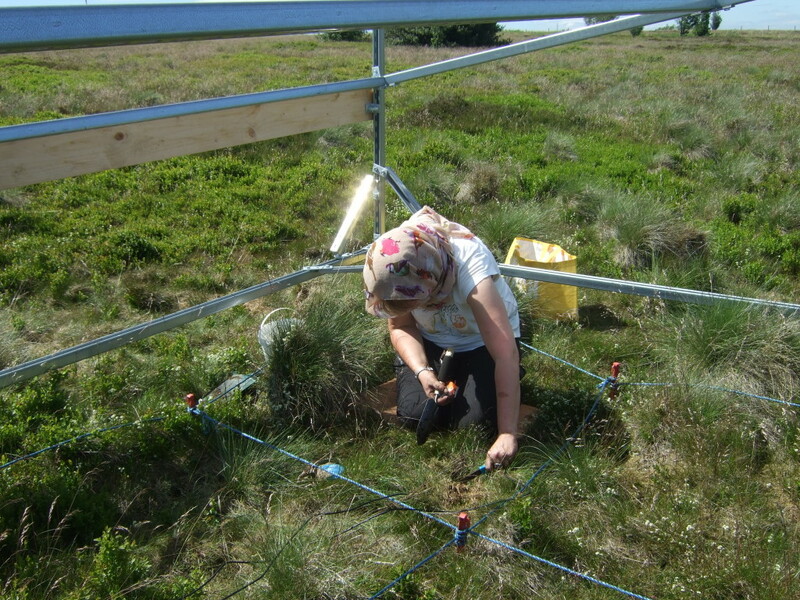 June and July have been very busy months for those of us involved with the grassland experiments. At Easter we set up steel frames in six different grassland sites, two in each of three river catchments: the Frome near Bristol, the Don near Sheffield and the Eden in Fife. In the autumn roofs will be put on the frames so that we can artificially reduce rainfall and thus mimic a drought. We want to learn how drought affects the type of plant found in the grassland, the productivity of the grassland, and the time at which plants flower. We also want to try and get a better understanding of the interactions between the plants, animals and fungi found in grassland. 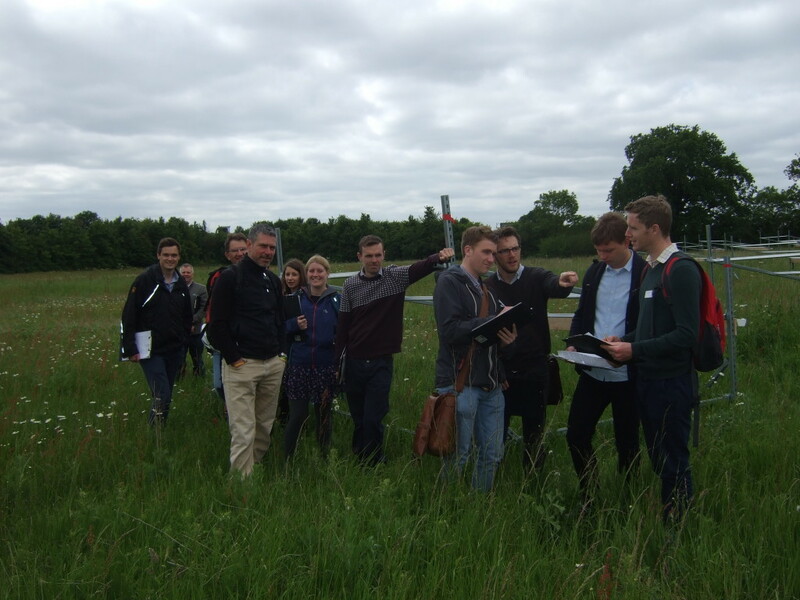 June saw the first public event using the field site close to UWE, in the Frome catchment; a field trip for secondary school geography teachers, seen here learning about the different types of plant found in permanent pasture. Sarah and Tash, helped by a volunteer, have completed the initial vegetation survey on both sites in the Frome catchment. We need to collect information about the sites before we put the roofs on the frames, so that we can see if our drought treatment causes any changes. The two sites are very different, with grass up to 1.5m in places on one site and 30cm on the other. Getting a quadrat frame into place over the tall vegetation was quite a challenge! 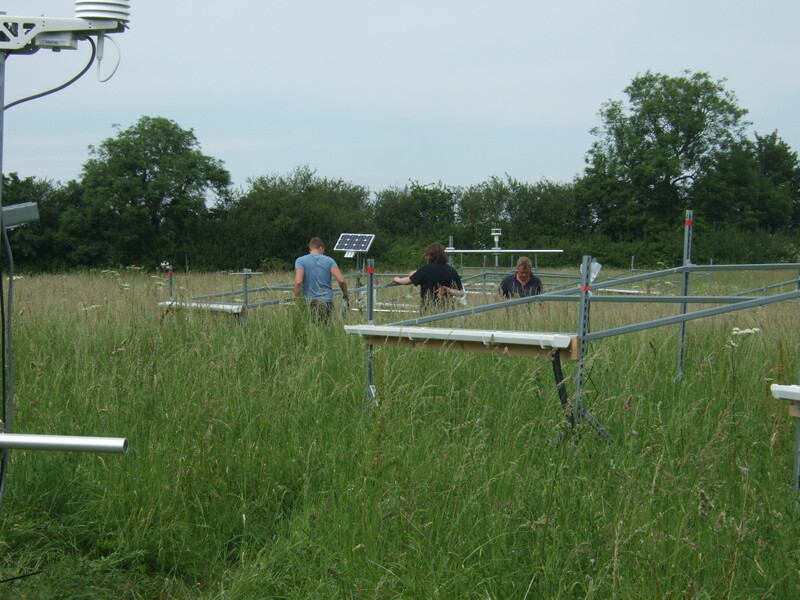 In June and July Sarah, Tash and Jill joined by staff from CEH Wallingford installed weather stations and equipment to measure soil moisture at all six field sites. Jill managed to arrange some of the hottest days this year for us, so instead of wellies and waterproofs we found ourselves needing sunhats and sunscreen. The information about the weather and soil moisture is collected and stored on data loggers. The data loggers are powered by solar panels, and automatically transmit the information to CEH Wallingford for use by the hydrologists there. Volunteers helped us in the Don and Eden catchments as seen here putting in monitors for soil moisture tension at Sheffield Univerity’s field station and marking out subplots in Fife.